Each one is best for specific purposes, so learn when to use them efficiently, and why. A git merge should only be used for incorporating the entire feature set of branch into another one, in order to preserve a useful, semantically correct history graph. Such a clean graph has significant added value. All other use cases are better off using rebase in its various incarnations: classical, three-point, interactive or cherry-picking. Medium is an awesome platform, but it lacks a few tweaks for proper code-/tech-related content just now, chief of which is inline monospace formatting with no typographical replacements in them (syntax-highlighted code blocks would be nice too, but I didn’t need these here). So I resorted to italics for commands, branch names, etc. This seems to remain legible, at any rate, this was the best I could do! I often see people put merge and rebase in the same basket, under the fallacy that both result in “getting commits from the branch across in our own branch” (which is, by the way, incorrect). These two commands actually have hardly anything in common. They have entirely separate purposes and, indeed, are not supposed to be used for the same reasons at all. I shall try to not only highlight their respective roles, but also equip you with a few reflexes and best practices so you can always produce a public history that is both expressive (concise yet clear) and semantic (viewing the history graph reflects the team’s goals in an obvious way). A top-notch history adds significant value to the whole team’s work, be it contributors coming in for the first time or getting back after a while away, project leads, code reviewers, etc. When should I use merge? As its name implies, merge performs a merge, a fusion. We want to move the current branch ahead so it incorporates the work of another branch. If the receiving branch (say master) has moved ahead since the branch started, and is therefore not a direct ancestor of it anymore, we’ll treat our branch as “too old” and use rebase to replay its commits on top of our up-to-date master to maintain a linear graph. But if master remained untouched since we branched out, a fast-forward merge (which would be automatic in that situation, by default) will be sufficient. Is it a “well-known” branch, clearly identified by the team or simply by my work schedule? Then we turn our previous reasoning on its head. Our branch may represent a sprint or story in our agile methodology, or an issue/ticket in our bug tracking system. Is is then preferable, perhaps even mandatory, that the entire extent of our branch remain visible in the history graph. This would be the default result if the receiving branch (say master) had moved ahead since we branched out, but if it remained untouched, we will need to prevent Git from using its fast-forward trick. In both these cases, we will always use merge, never rebase. When should I use rebase? As its name suggests, rebase exists to change the “base” of a branch, which means its origin commit. It replays a series of commits on top of a new base. This is mostly needed when local work (a series of commits) is deemed to start from an obsolete base. This could happen several times a day, when you try to push local commits to a remote only to be denied because the tracking branch (say origin/master) is stale: since it last sync’d with our remote, someone pushed updates to it, so that pushing our own code path would overwrite that previously-sent, parallel work. This is not nice to our collaborators, so push gives us the boot. A merge (which is what pull would do internally, by default) is less than ideal here, as it creates noise, wrinkles if you will, in the history graph, when the whole thing is really just a timing glitch in the sequence of work on the branch. In an ideal world, I would have worked after the others, from an up-to-date base, and the branch would have remained nicely linear. A need for rebase also arises when you started a parallel avenue of work (an experiment, an R&D work…) a long time ago but haven’t found time for it again until just now, except the base branch—the one from which your experimental one started out—has moved on considerably since. When you finally hunker down to work on your experiment again, you’d like to start from a more recent base, so you can benefit from its bug fixes and other nice evolutions. But a merge (e.g. of master in experiment) is not what you’re looking for here, even from a conceptual standpoint. Out of sheer laziness at the time, I lump together a number of unrelated changes in one big fat commit, instead of properly crafting single-topic, atomic commits; such mammoths invariably end up with lousy messages like “stuff,” “lots of changes,” etc. This is all OK so long as it remains local, but out of respect for others and myself, I avoid pushing that nice little trainwreck on the remote: before I push, I clean up that history by using the über-cool git rebase -i. The base commit (say origin/master) doesn’t change, only the series of commits since is rewritten, and it’s entirely local so it doesn’t jeopardize the work of others. The following principles embody reflexes you should acquire; in the remainder of this article, we’ll dive into the details of the Git commands to achieve these effortlessly. When I merge a temporary local branch… I make sure it doesn’t show in my history graph by ensuring a fast-forward merge for it, which may require a prior rebase. When I merge a well-known local branch… I make sure it shows in my history graph, from beginning to end, by ensuring a true merge. When I’m about to push my local work… I clean up my local history first so I can push something clean and usable. When my push is denied because of extra work that got pushed in the meantime, I rebase on the updated remote branch to avoid polluting the graph with lots of ill-advised micro-merges. When it represents a well-known body of work (a task in the project management system, a bugfix linked to an issue or ticket, a story or use case in your agile methodology or project documents, etc. ), then it is desirable for it to remain visible in the long run, even when the branch name gets deleted. Otherwise, the branch was just a technical entity and has no reason to keep “existing visually” in the history graph. We will then make sure we use a fast-forward merge for it, which may require a prior rebase of it. Let’s see what both situations look like. Let’s assume we have a feature branch called oauth-signin, and a receiving branch that is master. If master has moved on since oauth-signin sprouted from it, we’re good. This might be due to other branches getting merged in master; or direct commits on it; or someone cherry-picked commits in it. At any rate, there is now a divergence between master and oauth-signin. 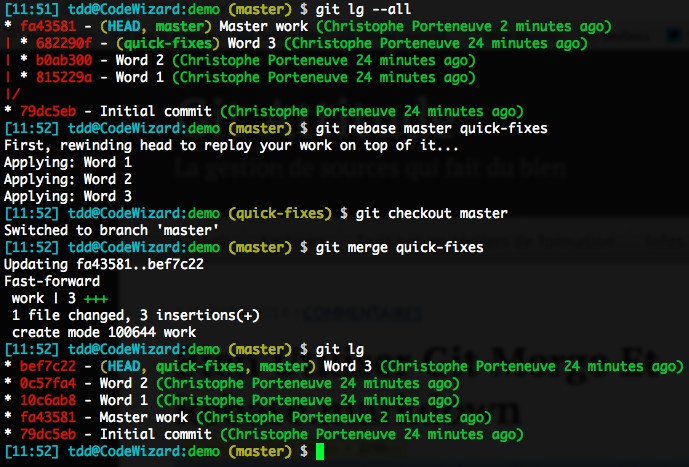 Git will automatically go for a true merge then. This is what we want, with no particular tweaks to get it. However, if master hasn’t moved since oauth-signin sprouted from it, the latter is a direct descendant of master. Which means that Git will, by default, react to a merge by doing a fast-forward: it will not create a merge commit, but simply move the master branch label to the same commit oauth-signin points to. The oauth-signin branch becomes transparent: the graph does not isolate its starting point anymore, and once its branch name gets deleted, there won’t be any trace left of it in the graph. This is not what we want, so we’ll force a true merge by using the --no-ff option (which obviously stands for no fast-forward, not no Firefox). This is the opposite situation: our branch should not remain visible in the graph, as it bears no semantic value. We must then ensure the merge will end up doing a fast-forward. Let’s assume we have a comfort, just-for-safety local branch named quick-fixes, and master is the receiving branch. If master hasn’t moved on since quick-fixes sprouted from it, we’re in the clear: by default, Git will perform a fast-forward. On the other hand, if master did move ahead since quick-fixes started, we would get a true merge and our branch would pollute the graph, which we obviously don’t want. Adding the --ff option wouldn’t change anything: this is already the default behavior, and produces no miracles. As for --ff-only, it only refuses true merges, so it will block our merge attempt. What we need is to tweak quick-fixes so it becomes a direct descendant of master again, making the fast-forward possible. The perfect command for this is indeed rebase. This is exactly what we’re trying to do here: we want to change the base commit of our quick-fixes branch so it is not the old tip of master but its current tip. This will rewrite the history of our quick-fixes branch, but as it is strictly local so far, that doesn’t matter a bit. By rebasing a diverged local branch before merging it, we can ensure fast-forward, so guarantee it will be transparent in the final graph. Finally we merge it, the default fast-forward being available now. And voilà! Depending on the nature of our branch, we are now assured to always obtain the graph we want. The behaviors we discussed so far reflect the default Git settings: it will perform a fast-foward whenever possible (the merged branch is a direct descendant of the receiving one), and do a true merge otherwise. If you stumble while trying out the previous examples, or on any repos you might use, do check your local and global configurations. Beware though: if that branch had been pushed to a remote (for backup purposes, for instance), you’ll need to force the next push of it with the -f option, as you just replaced its commit history with a fresh one. When using Git correctly, we do frequent atomic commits. We also are mindful not to fall into the “subversionian” reflex of commit+push, which reinstates one of the graver faults of centralized source control: every commit is immediately sent to the server. Indeed, that would deprive us of the flexibility of decentralized source control, which lets us be flexible as long as we haven’t pushed. All our local commits are for now ours alone, so we have complete freedom to clean them up, rewrite them, cancel them, right up until the moment we share our work through the remote. Why deny ourselves that flexibility and confort by pushing too often, too soon? In a typical Git workflow, you’d easily hammer out 10 to 30 commits a day, but would usually only push 2 or 3 times, sometimes even less. Repeat after me: before pushing, I shall clean up my local history. Out of sheer laziness at the time, you lumped together a number of unrelated changes in one big fat commit, instead of properly crafting single-topic, atomic commits; such mammoths invariably end up with lousy messages like “stuff,” “lots of changes,” etc. This all yields a rather messy history, difficult to read, understand or leverage by others; and don’t forget: others is you too, 2 months down the line. This all hinges on a rather refined use of reset and commit, but rebase provides an interactive mode that will drive it all in a rather sweet, more user-friendly way. Interactive rebasing is just like regular rebasing, except that instead of following a simple, foreseeable script (“I’ll cherry-pick every commit one by one, just skipping those that end up being duplicates on the new base”), it lets you edit the script beforehand. In our current situation, the rebase will not, actually, change the base. It will only rewrite the history since that commit. In an everyday situation, that branch already exists on your remote, and you wish to clean up the local commits you made since your last sync (usually your last pull). Here you’re rebasing the current branch (experiment) on a commit that already exists in its history (origin/experiment). If this rebase wasn’t interactive, it would be useless (and would indeed be short-circuited as a no-op). But thanks to the -i option, you’ll be able to edit the script of operations rebase will go through. 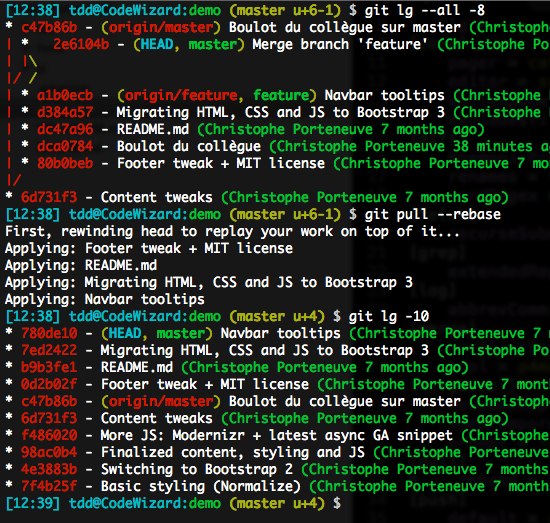 That script will open in your usual Git editor, the same used for commit messages, etc. pick c591fd7 Revert "Opinion bien tranchée"
As per usual, Git is nice enough to throw an ad-hoc bit of documentation our way (considering your average developer would rather die than actually browse the doc…). The script at the beginning describes what rebase will eventually do. By default, it’s a classic rebase: cherry-picking in sequence for every commit in the list. Note this list is chronological (unlike git log, which by default starts from the most recent and works backwards in time). Like any editor-based Git operation, leaving only blank or commented-out lines will cancel the operation. Removing commits: we just need to remove their lines. Reordering commits: we just need to reorder the lines! Actual success is not guaranteed, however; if commit B’s changeset depends on code introduced by commit A, inverting them will obviously result in trouble. 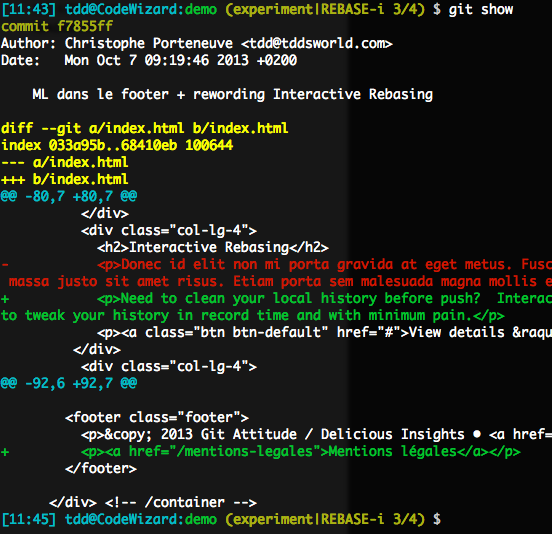 Rewording commit messages: because of typos, lack of clarity, etc. Use the reword verb. There’s no point in changing the message there and then, though: Git will ignore it but open the editor when the time comes for you to rephrase the message. Squash commits together: now that depends on why you’re squashing. The squash verb will squash both the changesets and the messages. This is seldom what you want; most of the time, it’s a bugfix that took you several commits to finalize, so the original message is adequate; in that situation, prefer the fixup verb. 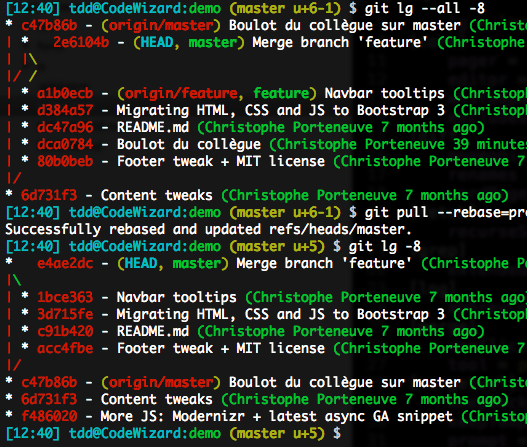 Split a commit: this is the most advanced use case. Git will apply that commit, and then hand it out to us, over a clean tree. It is up to us to do whatever tweaks we want, then tell rebase to resume its operations, again from a clean tree. The adequate verb here is edit. The situation above is intentionally über-messy, quite more so than everyday pre-push contexts. But this serves to illustrate all the use cases in what follows. We used two distant commits to introduce the desired locale: we first added the locale with a value of fr-FR then changed it later to the less restrictive fr. Simply removing the first commit would not work: the second one would not find the code context for its own changeset and fail to cherry-pick. No, we need to squash these commits together. In this situation, we could also have left the first commit alone and used squash for the second one: Git would have popped open our editor when squashing the latter commit so we had a chance of rewording the squashed message, which would have worked for us too. We save the script, close the file, and rebase takes over. Almost immediately, it honors the leading reword by opening up the first commit’s message in the editor before applying it. 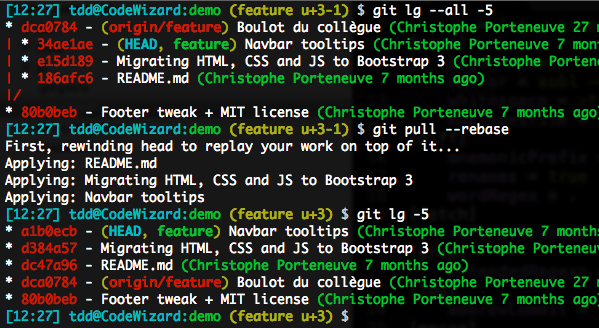 Note the two first steps, without modified commit message. Then the commit to be split, which was indeed applied, as our prompt testifies by not mentioning any dirty or staged status: we’re on a clean tree. There are tons of ways for us to do this splitting. We could, for instance, start by turning the freshly applied commit into dirties (unstaged file changes) with a git reset HEAD^, then craft our split commits one by one, by judicious use of git add or even git add -p.
Two perfectly unrelated changes in a single file, lumped into one commit out of sheer laziness. What we want is to turn a part of this (the first hunk, with the rewording) into unstaged changes for a later commit, and keep the bottom hunk (the legalese) there for our first commit, which will amend the just-applied lumpy one we originally had. 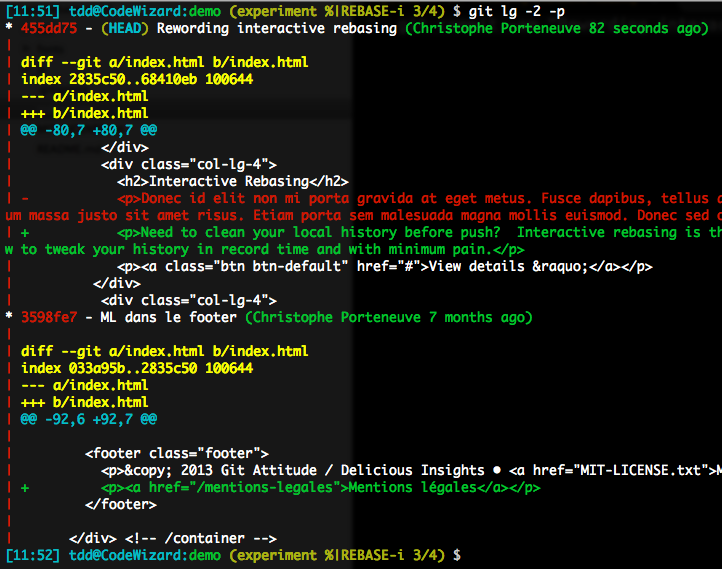 Splitting a single-file lumpy commit, the I-know-git-reset-for-real way. My oh my, is that a cleaned up history or what? We have now reached the final rebase-related topic I want to address: git pull. When we work without collaborators on a branch, we have it easy: all our git pushes get through, no need to git pull frequently. But as soon as there are many of us on the same branch (which is indeed a frequent scenario), we often hit a snag: between our last incoming sync (using git pull) and the moment we want to share our local history (using git push), another person shared their own work, so the remote branch (say origin/feature) is now farther ahead than our local copy of it. Nobody likes to hear they’re “rejected…” In such a scenario, most people follow by habit the advice Git gives and do a git pull to grab the remote work, then push again. This seems to work (the push gets through after all) but it sort of blows. Let’s see why that is. What does git pull do anyway? A network synchronization of our local copy of the repo (the “database” inside the local repo, the .git directory) from the remote repository. This is actually a git fetch. This is the only part that does need connectivity to the remote repo. By default, a merge (yes, git merge) of the remote tracked branch in our current local tracking branch. As git pull merges by default, any new work I pull besides my own local work will result in a merge, which pollutes the graph. This obviously goes against the rules we adopted earlier: a merge is supposed to represent the incorporation of a well-known branch in another one, not base technicalities. Here, we’re just out of luck: someone pushed before me on a branch we collaborate on. In an ideal situation, they would have pushed earlier, then I would have pulled and begun my own work, and the history would have remained linear. This is, indeed, what you always want to obtain on a pull (a linear history within a branch), and to get it, all you have to do is ask git pull to do a rebase instead of a merge, so it replays your local work on top of the newly obtained shared work. 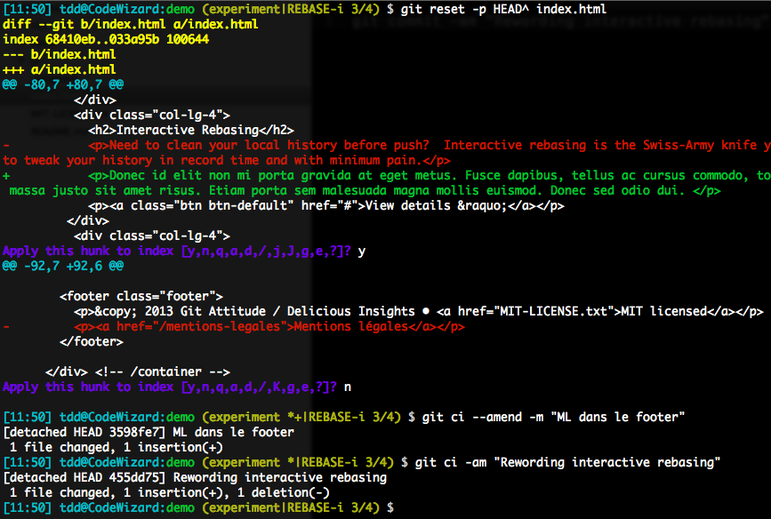 You can do that interactively, using git pull --rebase. This is, however, not a trustworthy solution, as it requires you to be ever-vigilant when you pull, which is unlikely: we’re just humans, and inherently fallible. Explicitly asking git pull to rebase instead of merging. Cool, but prone to being forgotten now and then. We can do better by using configuration options, local or global, to achieve the same result. This can happen at the branch level (e.g. local configuration setting branch.feature.rebase = true) or as a global behavior, which is what I recommend (e.g. global setting pull.rebase = true). Starting with Git 1.8.5, there is an even better setting value; but to understand why it’s better, we need to talk about pulling over a local history that includes a merge. Rebase inlines merges by default, and boy does that blow hard for most cases. We can avoid this by telling rebase we want to preserve merges: all we need to do is invoke it with --preserve-merges (or the shorthand -p). However, before Git 1.8.5, there was no matching option for git pull, nor was there a configuration setting for it. So there was a risk (however minor it was, considering this is all local and can be fixed again without straining our colleagues) in always pulling in rebase mode: any carefully crafted local merge risked inlining by a later pull, and if we were not vigilant before pushing it, it would end up in the shared history instead of the desired merge. More importantly, all configuration options now accept, in addition to the more-problematic true, the useful value preserve (e.g. global configuration setting pull.rebase = preserve). This is what I actually recommend you use. Pulling with a rebase, still preserving local merges. Yup, the Holy Grail. Well done you, you’ve read all the way down here, aren’t you the valiant one! I hope this in-depth article helped illuminate merge and rebase for you, so you can now pick the adequate approach depending on context, and keep your commit histories and their graphs clean, legible, and in the end bolster general productivity.